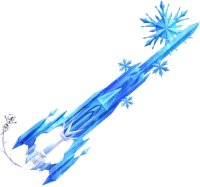 The Crystal Snow is the keyblade obtained from Arendelle in Kingdom Hearts III. It has an ice theme, with the blade resembling Elsa's snow palace. The keychain is a tiny version of Olaf. Its transformations include the Blizzard Claws and Blizzard Blades.